Google has updated Gmail for Android with Vacation responder, support for all file types in attachments, including documents, PDF, zip files and more, and printing emails using your device. Gmail Vacation Responder comes right in time for the holiday season. If you’re planning to go for a vacation and don’t want anyone to disturb you, you can create a new or update your auto responder message from Gmail for Android. The latest version also gives users the ability to print hard copies of their email. Unfortunately, this feature is only available for those running Android 4.4 KitKat, which is hardly one percent of devices. Lastly, the latest update promises to improve the performance of the application on devices with low memory as a part of Project Svelte — the latest project of the company to reduce Android and Android apps memory usage. 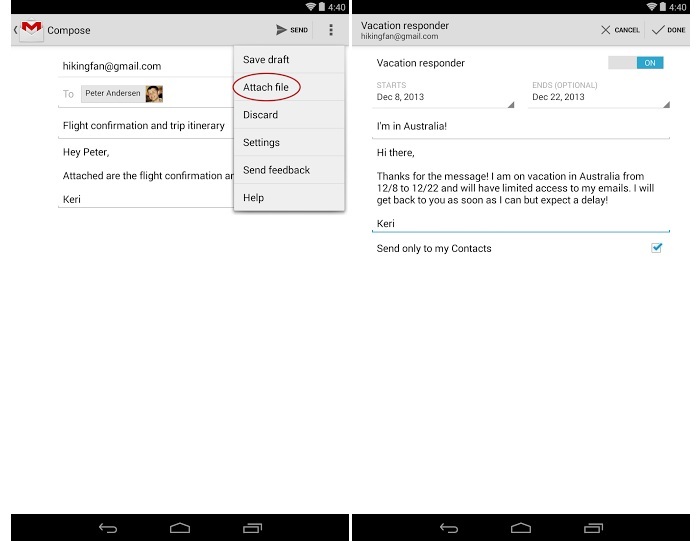 If you forget to set a vacation responder as you scramble to pack for a flight, you’re in luck since you can now create or update an auto responder message right in the Gmail app on Android. In addition to photos and videos, you can send attachments—documents, PDFs, zip files—of any type. You can also print hard copies of your emails if you’re using Android 4.4 KitKat. And finally, you’ll notice enhanced performance of the app on low memory devices as part of Project Svelte. The latest version of Gmail for Android is available for download in the Google Play Store.